Pearl Beach resorts and bungalows are a mix of older resorts, a boutique choice, cheaper bungalow operations and a few long stay rooms. All sit along its shingle shore or under the hills on the other side of the road. It’s a very peaceful and laid back area, with White Sand Beach and Chai Chet Beach just a few kilometres away in either direction, so you can easily head out to those spots for more life and some proper sand. At the northern end, the small boutique resort, Baan Ton Rak, continues to upgrade, with the addition of a small swimming pool and new entrance area alongside its excellently maintained rooms – superior rooms at 1,600bt and deluxe suites for the family at 2,500bt. Across the road, Remark Cottages, aimed at Thai weekenders, has a nice garden setting and a pool, but it is undoubtedly now showing its age. Rooms are normally sold as packages, prices in the 3,000bt for 2 nights range. 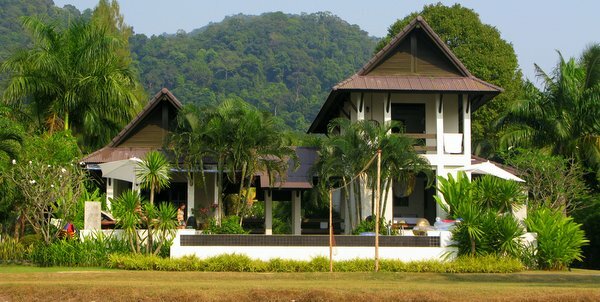 Keereeta Resort too is now one of Koh Chang’s older resorts and as a result, gets very mixed reviews online. It has a swimming pool. Rooms range from 1,350bt to 1,650bt for the upper level pool view. At the other end of the village down by the sea, Saffron on the Sea, one of Koh Chang’s best restaurants, also offers accommodation, boutique style bungalows at 1,000bt a night for ones at the back and 1,650bt for ocean facing. Just a few doors along, Penny’s Resort has cheap rates again in that 1,000bt to 1,500bt mark, its standard rooms closely packed around a small swimming pool. 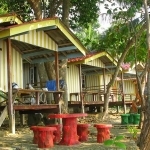 Koh Chang Resortel is a huge resort which sits on the seafront in the middle of Pearl Beach. Its’s a curiosity to say the least, with two double storey blocks of accommodation running alongside a fabulous Olympic sized swimming pool, keenly priced at 1,000bt a night but normally almost completely empty. Koh Chang Privilege, next door, has recently added some more rooms down by the water but otherwise it remains a very well spaced out bungalow operation, again with a small pool. With deals available, rates are in line with the other resorts. Inspiration Villa is a private holiday rental, ocean-side with pool, four double rooms and ideal for families. 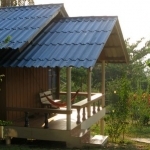 Near to Saffron, there are also some private villa come bungalows complete with a small central swimming pool – Villas Davide, Matteo, Marco and Tippawan – all available through Airbnb. Northern end by the road, small boutique resort hidden behind a scupltured wall, with 6 rooms, all a/c, off a central courtyard and a pretty garden sitting area. New swimming pool. Food available. Motorbike hire, German owned, friendly hosts. Southern end by the sea, 28 standard, luxury and different style family bungalows by the sea and around the pool. Restaurant and activities. Motorbike hire. As with all these resorts, there is no sand beach. At the southern end by the sea, 7 a/c boutique style bungalows, a/c with bathroom, both by the sea and in the garden, with the highly recommended restaurant on the doorstep, which of course does get busy. No beach. In the middle by the sea. Well maintained single, double and family bungalows laid out in a simple garden with small swimming pool and restaurant. New rooms by the water. Popular with Thai weekenders but rarely busy. An under the radar choice. Down a small entrance street between Tesco and Resortel, exclusive villa for rent with 4 double rooms, sleeping 8-9 people. Infinity pool, volleyball court, canoes, staff, private beach and landscaped gardens. 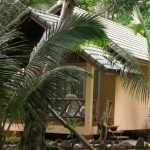 Pearl Beach has plenty of choice too if you are after cheaper standard bungalows. 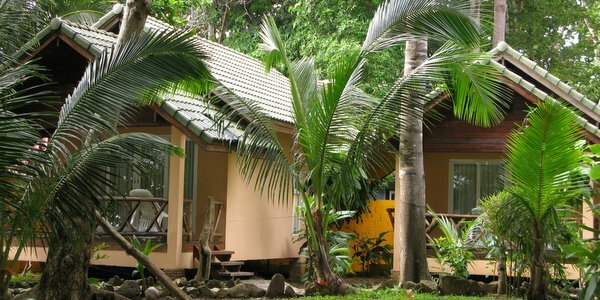 Macura Resort, TP Huts and Alisa are located in a little enclave set back from the main road at the start of the village, with prices from as low as 300bt for a very peaceful setting. Rose Garden opposite Tesco could make a good long stay choice, with monthly rates available at 6,000bt. Up above and accessed by a small track, the deservedly popular Elephant and Castle has terrific views out to sea, a personable English Cockney owner and very reasonable rates from 500bt a night. Paradise Palms is another English owned operation, 3 or 4 bungalows in the sea front, prices in the 1,000bt to 2,000bt (family room) range. At the far southern end up by the road, there is now a small Thai resort, with bungalows aligned in two rows up the hillside, which could suit someone looking for long term rentals. It does not, as yet, have an English name. Northern end inland at the first bend from White Sand Beach, selection of bungalows, fan and a/c, restaurant, all surrounded by lush garden with mountains behind. Motorbikes and WiFi. Very peaceful. 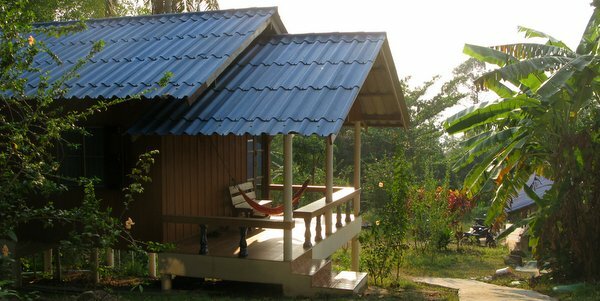 Same area as TP Huts, with a large selection of different rooms, family house and even a tree-house. Restaurant for breakfast. Motorbike hire. Practical, quiet. Same areas as above two resorts, offering new rooms or bungalows, fan and a/c. Breakfast and Coffee, motorbikes and WiFi all available. Could suit long stay. Towards the northern end, up a small track on the hill, 6 or so fan and a/c bungalows, with great views out over the bay. English breakfast a speciality from the English owner. Laid back, lots of dogs, nothing fancy, Long term deals available. Pearl Beach has just too many options to list in full, so here is a selection only to go with our recommendations above. Northern end on the ocean, with natural-style cottages and small pool in lush garden. Sometimes open restaurant. Thai packages. Older resort. No Beach. Northern end by the road, simple fan rooms in a row or larger a/c bungalows, all on a grassy area going up the hillside. No restaurant. Would need own transport but long term deals available. In the middle by the sea, standard and deluxe rooms in large hotel building next to Olympic sized swimming pool or separate bungalows around a smaller pool. Restaurant and bar. Rarely busy. Roadside, 18 Double standard and deluxe rooms in a two storey building, located by the swimming pool in this boutique style resort, with restaurant. Older resort. Down by the sea at the southern end, fan and a/c rooms, bungalows and wooden beach huts with restaurant in this large Thai resort. No beach, motorbike hire. Popular with Thai packages. 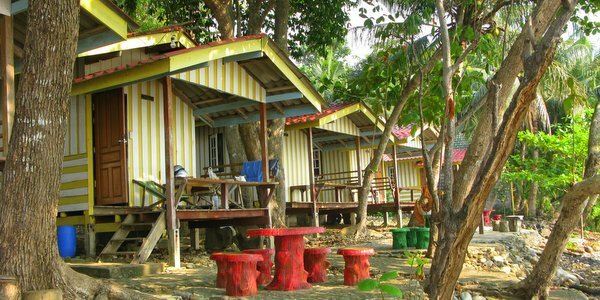 Southern end, small English run resort with three standard and one family bungalow by the sea. Bar and sun deck but offers breakfast only as no restaurant. Like the others, remember there is no sandy beach. Motorbike hire.